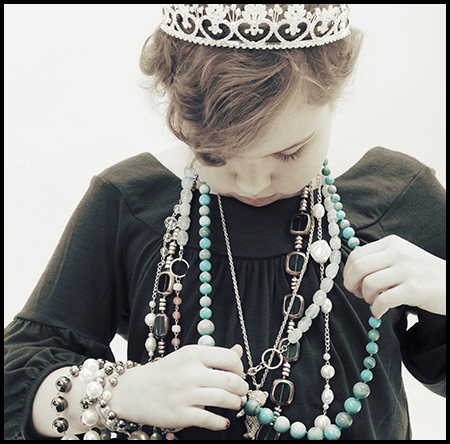 I moved to town when I was 9 years old, and while sometimes I think I must have come off as a bit of a freak to the local jeweler (what kid is this interested in jewelry? ), mostly I think my passion for his work must have delighted him. I always planned to follow in his footsteps, to become a jeweler. Life happened differently, of course, but when I finally wised up and decided to pursue my dream, even if a bit late to the game, it was Frank whom I called to get advice about training options. He'd gone to GIA, so I did too, and while a perfect end to this story might have been me buying his store, a slightly less perfect ending is me winding up in the sparkly industry of gems and jewelry after all; of seeing Frank at various tradeshows throughout the country; of being able to talk shop with this man I've long admired. Me wanting to make him proud could be a classic case of someone meaning much more to me than I did to him, but I still hope on some level that I succeeded; that the thought of this Graduate Gemologist's clumsy start as a shy salesperson cleaning fingerprints off the jewelry cases of his store made him happy. I dedicated my second book to him ("For letting me in, for showing me the ropes, and for always being so sparkly.") and after he read it, he told me he hadn't realized my time in his store had meant so much to me. But that's the thing about life, about plugging along doing the thing you are passionate about, however ordinary it is to you. Because you never know who you are influencing, what young person is taking note and making plans based on the appeal of your everyday. You never know when your ordinary will be someone else's sparkle. That's what Frank was to me. And I will miss him. If you are a professional, I encourage you to find a young person who finds your ordinary sparkly. Be a mentor, a friend, and let's do what we can to pass our passions down the line to those who come after. And if you knew Frank, my hometown jeweler, I trust you feel as lucky as I do. This was part of my display at Friday night's ArtNight Pasadena, an event I've now attended for the second straight year. Part of me wonders why I went back. Not that it isn't a GREAT event, but it's just such a big event. And all the authors get stuffed into various nooks and crannies in the castle-like (charming yet simultaneously stinky) library. Even for the few people who manage to find you in the back corner of this dimly-lit building, most of them aren't really prepared to pay for something inside a library. Not that they couldn't. But that, on principle, they believe libraries should exclusively provide free stuff. I do kind of get it. An event inside a bookstore will sell exponentially more books. Not that it was a total loss. 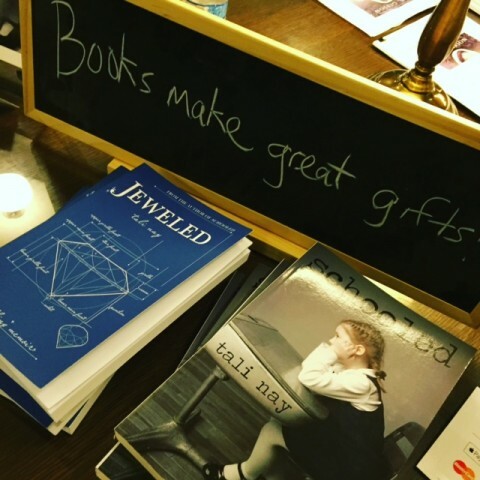 I met some great authors, sold a few books, and the best moment was when a woman saw the cover of Jeweled and loudly exclaimed, "I've read that!" She proceeded to ooze to the woman who was with her about what a fascinating and well-done book it is, and you'd think this other woman would have bought a copy. Indeed, before I got into this whole book thing, I was sure all I needed was a small core group of people who read and liked my books, and that The Snowball Effect would take care of the rest. That your book sales largely stop with this core group of people who read and like your books has been one of the most surprising lessons of bookselling. "I may be back," the woman's friend said after looking at the front and back of Jeweled, an obligatory response to her companion's glowing endorsement. She never came back, but then again, I knew she wouldn't. I'll continue to do these events because, in spite of everything, I enjoy them. And because you never know who'll come by, like you, read your stuff, and start the snowball that will eventually lead to your big break. Or at least lead to someone loudly exclaiming in front of a room full of book lovers that yours is particularly fine. There is something inherently ridiculous about getting your photo taken as an adult. Honestly. Who takes themselves that seriously? And sometimes when I see people post obviously professionally-taken photos of themselves looking totally cute, I roll my eyes. Like, a lot. I mean, doesn’t it kind of remind you of that scene in While You Were Sleeping where she goes over to Peter’s apartment and there’s that picture of him framed on the counter? Framed. Of him. Displayed in his own apartment. Can you say selfish and shallow? I can. I had some headshots taken about four years ago. For bookish purposes, I might add. The photo that’s been on my website and social media channels since that time came from this very photo shoot, as did the author picture I used in Jeweled. Given how unnatural it seems to have photos taken of myself, I had planned on using the same picture in my upcoming book as well. Waste not, am I right? But people started generally remarking about how different I now look from those photos four years ago. And while there’s no way I’m doing this every few years just because my hair is different, people did seem to have a point. So I scheduled another photo shoot. And while I certainly battled some amount of “you are as ridiculous as Peter Callahan” demons as the photographer snapped away, my confession to you is that I loved this photo shoot. I did. I loved it. I loved wearing my cute little city outfits in San Diego’s sleepy Old Town. I loved feeling momentarily beautiful. And I loved the photographer’s comment that I had the gift of no one being able to tell how old I am. I am a freaking illusion. The shot above was my favorite of the day. I didn’t opt to use it for anything official, but if I were Peter Callahan, this is the one I would frame and put on my counter. Just saying. This store hosts a Northwest authors fair each summer, and for years I've been trying to get in. Nevermind that I no longer live in the Northwest. Nevermind that I spend much more getting to author fairs than I make in book sales from them. That's not really the point. The point is me, feeling like an author, introducing my books to people and seeing their faces when they smile that "I want to read this" smile. 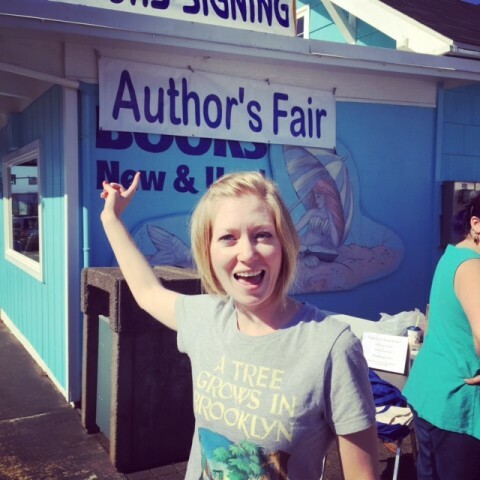 A word about Bob's Beach Books, because I can definitely see why so many authors want to return to this event. It's remarkably well-run, mostly due to the efforts of the store manager, and, now that I've visited, it's exactly the kind of small-town independent bookstore that I would frequent if I lived there. Here's hoping I get in again next year. Because coastal air up north is so refreshing. And because Oregon has no shortage of kindred spirits. Even if so many of them do prefer quilting murder mysteries and cult vampire thrillers. I've been eyeing this project for some time, although I must give credit to my sister, as she's the one who pointed these watercolors out to me in the first place. At first it was suggested that maybe I could attempt them myself, though I doubt this option would have produced something that made sense being displayed on my living room wall. Maybe more like my fridge...if I had a young child to whom I could attribute their creation. It took several stops to find somewhere with frames both as colorful and cheap as I was after (I was buying twelve of them, yo), and don't even get me started on the hours-long ordeal of trying to line them up straight and with equal spacing. My brother had cautioned I should not attempt it without measuring tape, a level, and a second person to help me, but I have none of those things. So I went for the always solid Trial and Error approach, and the project is now done. There are also about a billion tiny nail holes in my living room wall. 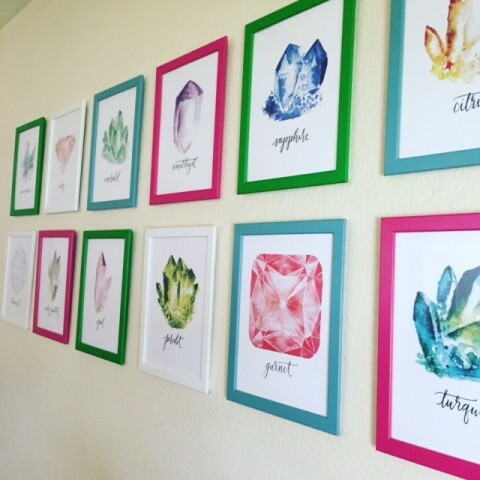 I realize that decorating your walls with gemstones is not normal. But I'm really not a normal girl. My affection for all things gem is the epitome of abnormal. But surely you know that by now. I freaking wrote a book about it. And quit my job to study it. And moved across the country to work in it. And now, thanks to this weekend's project, every night I will come home to it. Besides, what's so great about being normal, anyway? It sounds much less sparkly. Now, if coming home to find this blingitty bling bling gift on your front porch doesn't make up for you not winning the Ugly Sweater Contest at the holiday office party, then I'm not sure what will. This Christmas just got a whole lot better. PS - My sweater was hideous. My sister is a great gift-giver. The best I know. She almost never asks me for ideas, she just spends the year quietly collecting things that make her think of me, things she thinks I'll like, and then I open her Christmas gifts having absolutely no idea what to expect. These kinds of gifts are my favorite to open, and they are usually spot on. Which proves what is possible when you truly know someone. Cases in point. She bought and restored an old writing desk I adore and have schlepped across the country twice and still use. She tracked down the album of songs that a well-known hospital clown sang at Oakland Children's when I was a patient there in the late 1980s. Songs that I listened to for years afterward on a tape I eventually lost track of. Silly I guess, the songs, but being reunited with them so many years later was one of the biggest and most thoughtful surprises I've ever received. One I didn't ask for but loved. If I ever had a child and found myself doing the family thing, I'd be tempted to implement a no-list policy. Meaning no one would be allowed to ask for specific things; rather we'd all just shop for each other based on what we knew the others would like. It means more, right? It's better, right? Of course, it's also harder. Not to mention, not everyone can do what my sister does. I think she has a knack. A gifting skill set. Whereas I always seem to say--about my own siblings and parents--"What on this green earth can I *possibly* get them?" Which seems an odd thing, being unsure what to buy for, say, the woman out of whose womb you tumbled forth. Um, maybe a pedicure? Some chocolates? I just DON'T KNOW! Just yesterday I sent off my Christmas list to my two brothers and my parents, and it reminded me that 1) lists make it SO EASY to shop for people, and 2) on the receiving end, you know you'll be getting things from that list; things you definitely know you like/want/need/have been coveting. It's sort of like the proposal conundrum I talk about in Jeweled. How a girl probably appreciates the Leap of Faith more than the Slam Dunk, but then again, she does want to like the ring she gets. Insert something about tradeoffs here, and I don't have the answer. But I am curious, dear reader, do you prefer giving and working off of lists, or are you won over by the idea of the heartfelt crapshoot? Please answer. These things keep me up at night. of whose womb you tumbled forth. Maybe a pedicure? Some chocolates? things keep me up at night. For those waiting on the results of my candy experiment, having a big bowl of chocolate at my table did draw in a record number of visitors. Indeed many other authors at last weekend's Pasadena ArtNight commented to me on how popular my candy was. Not that it really sold me any more books. People just wanted some candy. Jerks. It was a great event though, the ArtNight. And hats off to Pasadena for arranging such a complete and hassle-free experience. I found myself wishing I could ride the free shuttles around town to the different buildings housing various artists and musicians for the evening. What a great way for a city to see and experience a wide mix of genres and talents. And such a great reminder, for those of us at the library, of just how many people out there write books. Of course, it's also a reminder of how there really is something out there for everyone...and about a billion things not for everyone, which is why indie book selling is and always will be so challenging. There's a relatively (read: extremely) small number of people out there who are interested in reading your books. As opposed to all the other books they could be reading/buying. But I suppose that's what makes the world go round. And keeps the traffic at a book fair moving. As for that traffic, however, there might have been more of it had the library's $1 books room not been right next to the author area. Made our prices a tough sell...even with candy. I woke up last Thursday morning to the sight of a woman at the top of my driveway putting a bag of dog poop in my trash can. And so I stewed on this for hours, feeling pissed and a little violated. What is wrong with people? It took hearing the Roseburg news to shake me from my ridiculousness, because in the grand scheme of things, who cares about dog poop? In the grand scheme of things, who cares about anything other than the health and safety of the good people of this planet? What’s worse—or at least what hit me hardest about this most recent mass shooting—is that it happened right near my own hometown. Mere miles from both the home where I grew up and the beloved jewelry store I talk about in Jeweled. The UCC campus itself is where I attended countless dance recitals and community musicals, competed in high school choir competitions, and took yearly school exams. And so I’ve been sad for my community, even though I no longer live there. I’ve been angered at the vulnerable situation these no-gun zones put people in (think the school in Sandy Hook, the movie theater in Aurora, UCC, etc). I’ve been inspired by the faith and hope of those who have been most affected by this tragedy. And I’ve been completely unconcerned about dog poop in my trash can ever since. I'm getting ready for an author fair next week. I love author fairs. Book events of any kind, really. It's nice to be reminded you're an author, especially when just a lowly one like me. Because sometimes I forget. Sometimes I feel discouraged and wonder why I do it. But an author event can bring me back to myself...my writerly self. The question at any author fair is, of course, how to get people to buy your books. Selling books is hard. People can't just look at a book like they can jewelry or artwork and know they will like it. And people aren't as free with their money as they used to be. An author fair attendee peruses everything and oftentimes buys only one book. One book. So how do you make sure yours is the book they buy? Just make sure yours is the most interesting book. Right? Possibly out of your control, but even if it weren't, before a person can even think your book is interesting, you've got to get them to approach your table. And there are *a lot* of tables at an author fair. Most of the time all lined up in a row or arranged in some other closely-spaced configuration. I don't know what the magic formula is--something tells me it probably involves a low-cut top, a celebrity guest, and an expensive giveaway--but I may try out a few new things at next week's fair. (Much to my sister's disappointment, I will not, as she suggested, be hiring friends to hang around my table and act very interested, thus creating the illusion of mass intrigue and popularity. But that's really only because I can't afford it. And also because I don't have many friends yet...new in town, remember?) In any case, if you find yourself in Pasadena next weekend, I hope you'll choose my table. There will be candy. Which, come to think of it, is probably almost as good as a low-cut top. I should probably be doing more to prepare for this blizzard than listen to the 80’s Hits radio station and fold laundry. But clean underwear should be near the top of anyone’s snowed-in list. And I stand by that. Since I will inevitably lose power in this storm, I thought I’d first say a few words about the opportunity I had this weekend to serve with the DOROT organization. A Jewish organization (the word means ‘generations’ in Hebrew), they work to serve the elderly, particularly by connecting them to younger volunteers, many of whom form lasting relationships with the elders they serve. Yesterday DOROT delivered winter care packages to hundreds of elderly (many of them shut-ins, unable to leave their apartments) throughout NYC. The packages contained not just food, but warm hats, gloves, and other things needed in winter. (Just in time for the storm!) Of course serving others is its own reward, whether or not the experience is a particularly positive one, but I feel doubly fortunate that the woman I was assigned to visit was such a gem. As a society, there’s so much we can do for each other. I know time is precious and not one of us has nearly enough of it. But if any of you in the NY area are looking for an opportunity to serve, I strongly recommend this organization. You don’t have to be Jewish (“Well you’re obviously not Jewish,” the woman I visited pointed out rather comically when my blond-haired, blue-eyed self showed up at her door), and I promise you you’ll not only enjoy yourself and want in on the next planned delivery day as well, but you'll also wish you had gotten involved sooner. Recently I had the opportunity to participate in a book group discussion. I don’t belong to any book groups, and never really have (other than this one time, but I only went once, when that month’s book was something I had already read, but the host’s house smelled like fish and it was hard to hear over the yappy dog being kept in a bedroom), but a book group over on the west coast invited me to participate in the discussion of their January book, which just so happened to be one that I wrote. It’s a weird thing, listening in when a group of readers are discussing your book. It’s even weirder when they’ve got you up on the big screen TV while you’re talking. But technology is pretty cool when you think about it. And it got me thinking about how nice it would be if, after finishing a book I’d enjoyed, I could have a conversation with the author, ask her any questions, tell her I particularly liked this aspect or that. And that’s what these ladies did. They asked questions about jewelry, questions about writing Jeweled and if it was harder or easier than writing Schooled. 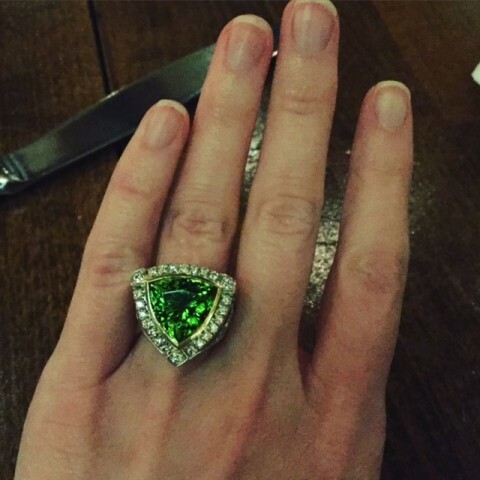 They asked if I visited my jeweler when I was home for Christmas, asked about conflict diamonds, giggled about my musings on old-lady veins, shared how powerful the opening scene was with the whale. They even answered a few questions for me which might help me shape the structure of my next book, which I’ve recently begun to rethink. How grateful I am for readers, for books, for kind words, for camaraderie. I’m also grateful for the times that make me feel like a real author. I will not say that they happen a lot, but when they do, it's enough to keep me going. I love living in New York, but it's hard to beat this view out your back window. Yes, I love living in New York, but I'd be lying if I said it was stress free. Au contraire. It's noisy, it's expensive, and the woman downstairs keeps whacking her ceiling as hard as she can every time my cat runs across the room. Of course, these things seem less significant when compared to all the wonderful things about living in New York, but still, there are days it wears me down. There are days when the woman downstairs wins. All of this is to say that I am enjoying my extended Christmas vacation in Oregon perhaps much more than I have in other years. The contrast is so refreshing. Everything is quiet and the air smells clean and piney. There are tree-covered hills in every direction. There are high school friends raising families. There is my jeweler who asked me once again yesterday how long before I am ready to buy his store. Of course, these things seem less appealing when compared to the economic challenges and realities of living in rural, southwestern Oregon, but still, there are days when it wins me over. There are days when the city can't compare. I know, I know. A girl can certainly have roots and wings, and I guess I should consider myself fortunate that both places are so special to me. And with that, I must return to my Christmas Eve activities. There's a pie to bake, presents to wrap, a party to attend. I can promise that before stepping into the building tonight, pie in hand, I will pause, surrounded by green on all sides, and take a deep breath in. And it will smell like rain and trees. More than that, it will smell like home. Like Father, Like Son. Like Brother. There’s a part in Jeweled where I mention my brother’s wedding. How at the time, he being so much younger than me, there was a part of me that was sad about him passing me up in terms of major life milestones. It’s just not something I had ever pictured happening, him getting married first. Of course, now he’s been married for almost 6 years. (Me, still single.) And this past week he became a father. Talk about major life milestones. It’s not sadness I feel this time at having once again been passed up, but it does make me think. And not just about my dwindling egg count. No, I’ve been thinking a lot about my brother. And every time I’ve heard him say “my son” this week, it’s like I hallucinate back to a much earlier time in our lives. Quite frankly, I don’t know where the time has gone. I don’t know how it is that back then has become so long ago; so far-removed. It’s not that I want it back, not exactly, because I think it’s kind of nice as we’ve all settled into adulthood, become Real People. But for my brother, his new arrival does mean a permanent pivoting. Toward the future and his new family. It’s wonderful and I wouldn’t have it any other way. And yet. I think I’ll miss those over-the-shoulder glances he used to throw my way, toward the homebird nest and our idyllic childhood. Something tells me he won’t be looking back quite as often now.